The postwar AEC Regent was originally designed in conjunction with London Transport, the prototype chassis running in service in 1937. The 'RT' body did not appear until 1939, with 150 entering service before the War halted production. A total of nearly 7,000 RT family buses (just over 2,000 were Leyland engined versions) were built, the last being built in 1954. Air brakes and air operation for the pre-select gearbox could then be regarded as futuristic - compare this with the Leyland TD1 of 1927 (WH 1553). It is fitted with an AEC 9.6 litre engine which develops 115 bhp at 1800 rpm. This example of a nationally important classic, OLD 714 (London Transport fleet no. 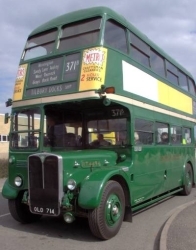 RT 4494) was delivered in July 1954, in 'Green Line' coach livery to Grays (Essex) garage, for route 723 from Tilbury to London (Aldgate.) Despite the 'coach' status, the only visible difference at this time between this and standard 'country buses' was a lack of advertisements, and a light green 'waistrail' band. Country area and 'Green Line' RTs did however have a different rear axle gear ratio than central (red) buses, to allow a higher top speed. A Park Royal body was carried at this time, which had entered service in 1949 on red liveried SRT 92, this was a modified pre-war AEC Regent (STL type) chassis, this (not entirely successful) hybrid type was the result of an urgent need to keep as many buses as possible on the road at a time when new bodies were being built faster than chassis, and many existing bus chassis were good for a few more years, but bodies were not. In 1959, the only programme of modifications (other than livery) to the RT class started - the fitting of saloon heaters and flashing direction indicators ("trafficators" in London Transport language.) The 'Green Line' RTs were the first in the fleet to receive saloon heaters. 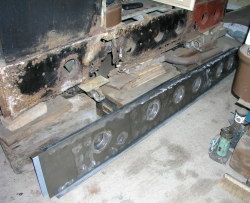 In common with almost all London RTs, the body and chassis were separated at overhauls at Aldenham Works, and the body currently carried was not the original one for this chassis - bodies and chassis took slightly different amounts of time to overhaul. It is also probable that this chassis has not always carried its current registration number and fleet number. London Transport had special permission from the (then) Ministry of Transport to swap vehicle identities to avoid paying part months' road tax on vehicles that were off the road for overhauls - the theory was that the 'old' and 'new' versions of 'the same vehicle' should not be on the road at the same time (and this only went wrong a very few times!). 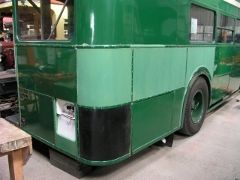 A number of bus identities were considered to be a permanent 'works float'. A more detailed explanation of the system can be seen on the 'Red RF' website, and a video on youtube here. In 1965, RT 4494 became a 'bus' rather than a coach, new RMC and RCL class Routemaster coaches (which, unlike the 'coach' RTs were different from the 'bus' version, with more comfortable seating, luggage racks and platform doors) replacing RTs on route 723 - RT 4494's conversion consisted of painting the waistband cream and allowing advertisements to be carried. After overhaul in 1966, this bus received its current Weymann body (8985, which had been new in 1954, on 'country bus' RT 4744) and became one of the four in the Country Bus fleet fitted with 'Loadmeter' equipment - this can best be described as a backsides-on-seats meter using micro-switches in seat cushions (we have not been able to establish how accurately this worked! ), and saw service at many different country area garages to gather data. Passing in 1970 to London Country Bus Services, who took over the country bus network from London Transport, RT 4494's last service days were at Leatherhead Garage (Surrey) prior to withdrawal in 1972. Photgraphs of RT 4494 in London Country days, working from Leatherhead Garage can be seen on Flickr - on routes 406 and 470. RT buses (some dating from 1948) served London Country until 1978 and London Transport (central buses) until 1979 - not bad for a vehicle designed 40 years earlier! Many London RTs saw service outside the Capital, as demand for buses in London fell in the late 1950s leading to early withdrawal and sales. A few reached Lincolnshire, operators included Hornsby's at Scunthorpe, and Barton in the south west of the County. An N-gauge model of RT 4494 in London Country livery is available from Oxford Diecast Models. After use as farm transport, RT 4494 was acquired by members of the Society, and after extensive restoration, has been returned to 1960s style London Transport condition. 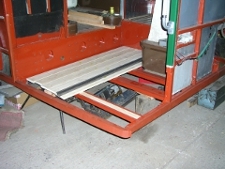 After many years on the road, and being a much travelled member of the museum fleet, it was off the road from 2008 to 2012 for replacement of the 'riser' - the part between the platform and the lower deck, and a very important part of the RT design as no rear platform extension is fitted to the chassis. This is a known weakness of RT type buses, tending to need repairs after about 40 years! 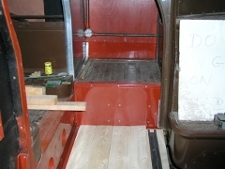 Much of the woodwork around the platform and rear wheel arches was renewed at the same time. April 2008 Since the last Open Day (November 2007) all the back end of the bodywork has been carefully dismantled to reveal, not unexpectedly, a (very) rotten body riser  and important part of the structure of these bodies as no rear platform extension is fitted to the chassis. July 2008 - Quite a large amount of the new woodwork has been cut out ready for fitting after a new 'riser' has been constructed. 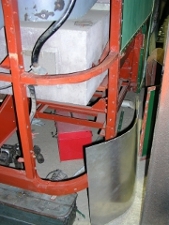 November 2008 - The new riser has been delivered, after construction by local steel fabricators, A J Engineering UK Ltd. Preparations are in hand to remove the old riser and fit this. 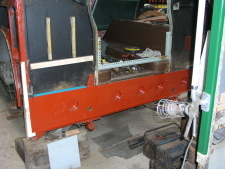 LEFT - New riser ready for fitting, old riser ready to be removed. 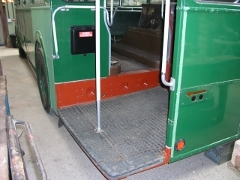 January 2013 - An MOT has now been attained and the bus gave rides at the Open Day. A subsequent slight air leak on the gear box is being investigated.